Columbia is a killer brand with a sleek and stellar style for men’s jackets. We were going to write a guide for windbreaker jackets, and when we realized just how many Columbia jackets we’d ordered, it turned into an all-brand affair. These guys have been producing some of the world’s leading low-cost and high-efficiency jackets for every weather occasion you can imagine. Below, take a delve into a dozen of our favorites from them, some information about the brand, and everything you need to know about maintaining your jacket, and the purchase process. One of the most cost-effective, waterproof, and absolutely dapper jackets that they’ve ever made: the Watertight II. Not only is this safe to throw in the wash, but it comes with a durable nylon shell, and comfortable polyester lining that won’t get tarnished or damaged from repeated wash cycles. Columbia didn’t want to leave you hanging, which is why they also included two waterproof side pockets to wrap this up. Select between twenty different styles and colors, and grab the all-weather jacket that’s fitted for runs on rainy days, hiking, camping, and anything else nature tries to throw your way. You can find other running options if you check our running jackets review. If you’ve never owned a jacket with a hideaway hood, you’re missing out. The problem with hooded sweatshirts is that having a hood just flopping around, tends to look pretty bad. Columbia put that into the front of their minds when they designed the Glennaker, which comes with a hideaway hood that slips right back into the collar. This is machine washable, and comes with an excellent water-repellent finish along the entire exterior, which is made of 100% nylon. Take full advantage of rain-resistant side pockets, and grab one of the most dually functional and flashy jackets we’ve ever reviewed. If you love the brand you can combine this jacket with some nice Columbia backpack from our list. If nylon isn’t your scene, you’re not alone. Plenty of Columbia jackets come with alternative fabric blends, like the Steens Mountain, made of 100% polyester MTR fleece. You’ll feel insulated within minutes; you won’t want to take it off. Steens comes in over two dozen colors and styles, and features a couple of security side pockets to maintain your valuables. Slip your wallet, card, or an EDC pouch in, zip it up, and you’re ready to fly. Last but not least, we have to point out the comfort of the padded collar, which provides some extra warmth in those winter months. You can find more winter jackets in out top down jackets review so check them out. Evapouration Jacket protects you from just about everything you can imagine. From the concealed storm hood to the waterproof coating, right on down to the comfortable and warm insulation along the interior, this is an all-weather jacket that’s itching to be put to the test. We love the lightweight build, making it a no-brainer to throw on before a hiking or camping trip. One of the key features is the ventilation in the underarm area. You’ve got a constant wingman that’s helping keep sweat at bay, so you can continue with your tasks without feeling a lack of self-confidence. In over two dozen inexpensive designs, the Ascender fills a void in your closet that’s been waiting for a champion jacket. 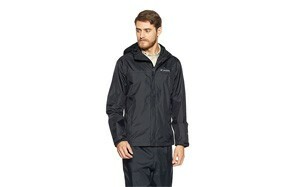 This water-resistant jacket comes in a 100% polyester shell, and is beyond safe to throw in the washing machine. If you’re using this for those light winter or fall days, then you’ve probably got one thing on your mind: that collar. This jacket comes with an abrasion-resistant chin guard, so chafing will be the least of your concerns. Dual pockets along the sides and a seamless zip-up: function and flair at their very best. You can combine this jackets with one of the shoes from our top Puma shoes guide. The Bugaboo comes with a plethora of hard-not-to-love features, first and foremost being the detachable storm hood. Hoods that slip into your collar can be uncomfortable; this comes right off, slips into your pocket, and problem solved. Choose from either your side pockets or chest pockets. 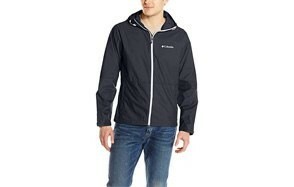 Apart from that, this is made of a 100% nylon shell, with a comfortable, heat-retaining polyester fleece lining. Ideal for the athlete in you who won’t quit just because the conditions aren’t ideal, Bugaboo stands up to the test of the elements, time, and whatever else you can throw its way. Find more great products like this by checking out our guide to the top Carhartt jackets. Hit the mountain roads, the cold hiking trails, and stay warm as a hearthfire with the Roan jacket. Thanks to an adjustable hood and drawstring waistband, you’re able to tighten this jacket in key areas as needed, ensuring no loss of body heat through airflow passages. The velcro wristband sections also help with this. Made out of completely waterproof nylon, you’ll be able to shed your shell when you step through the door, and emerge completely dry. You don’t stop for anything; shouldn’t your jacket company be the exact same way? Step into the fray with Columbia over your shoulders, and you’ll emerge victorious. For more great jackets like this, check out our Patagonia jackets review. When you were a kid, you always hated that puffy coat. Every kid had a puffy coat. 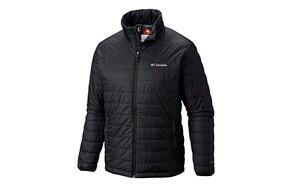 Columbia made Frost-Fighter Puffer form-fitting, stylish, and above all else, functional. You’ll be kept warm by a completely nylon lining, while keeping the rain at bay from the polyester exterior. Zippered hand pockets add a bit of added function, which comes in each of the eleven different variations in style and color. Columbia put this immensely insulated jacket at an unbelievably excellent price range, giving you one more reason to stay warm this winter: saving on the green. Our selection of the best bomber jackets offers more great products like this so check it out. Crested Butte II snagged our editor’s choice for this guide, and after just one look, you can assume why. It’s the perfect solution to the puffy coat, without sacrificing a slimming look. Crafted out of 100% polyester, this rain-resistant omni-heat jacket comes with duality: it also wicks away sweat that gathers up under the coat. You’ll be dry from neck to waist, inside and out. That sweat resistance is a back-up, because this also comes with a breathable technology that helps regulate your body heat, while keeping enough inside of the jacket to fulfill its purpose. This dapper coat comes in five different colors, and sits in a neat and narrow price range. You can combine it with a pair of good Nike sneakers and you are good to go. If you’re looking for a quick-and-easy coat to slip on when you can’t skip your run, but you don’t want to deal with the rain, Diablo Creek is right up your alley. This rain shell comes with a blend of nylon and polyester throughout each aspect, keeping it breathable, but also keeping it weatherproof. The omni-tech that Columbia uses in these jackets helps to regulate the jacket’s internal temperature as well, so that heat retention doesn’t have to mean overheating on top of it. This keeps your look slim-fitting, styled, and gives you nearly one dozen unique colors and styles to choose from. Go own the day, as soon as you own this jacket. There’s nothing but prime features in this attractively-priced coat from Columbia. Dr. Downpour comes with internal security pockets, so you can store your card, phone and keys without having to lug a backpack or have them jingle around in a loose-fitting pocket. Thanks to the detachable hood and omni-tech breathability, you’re able to keep warm without burning up. That also comes with a seriously excellent waterproof rating, so Mother Nature can’t bear down on you when you’re trying to get a good run in. Alternatively, you get a drawcord adjustable hood to control heat and comfort, and four excellent colors to choose from. Last but not least, we have one more killer coat for you to try. Saddle Chutes comes with that excellent omni-heat technology, keeping your body temperature at the right levels. With that, this waterproof exterior is also thermal reflective, so you won’t start feeling fatigued just because the sun decided to show its face today. You also get an internal security pocket to keep everything safe and tucked away on your run. 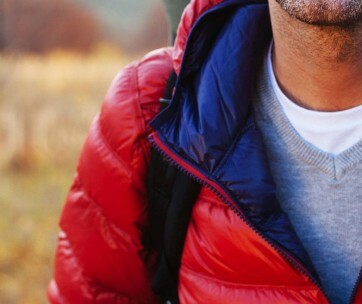 If you’re still not certain which jacket is right for you (trust us, we know how hard it is to choose), take a peek at the buying guide below, and come back up to this list when you’re ready. They’re one of the top brands for active and outerwear, which is why we’ve dedicated an entire guide to their excellent products. Proper protection and insulation are hard to come by, and with Columbia, they made it easier and more affordable than ever to mash together a slew of those high-end features you’ve been looking for in a jacket. A stylish, smart look is staring you down in the face: let’s discuss everything you need to know about their jackets, and circle on back to snag your favorite from our curated list. Versatility - Hiking, fishing, boating, running - you name it, and Columbia has a jacket that adapts to your activities and environment. Quality - We chose to do an entire guide on Columbia’s jackets because of how high-quality they are. Resting on the space between quality and affordable, these are a solid choice for casual wear and activewear needs. Design - You’re wearing it, so it has to have some major style points. We took a look at specific fittings, sizes, overall color schemes, materials, and smaller elements to ensure there’s nothing but stylish, form-fitting jackets on this list. Size - The size usually refers to a uniform system where 98% of men fall into. Small, medium, large, and so on and so forth. Fit - The fit refers to specific measurements, where you get a lot more in-depth information regarding to how it’s going to look on you, in particular areas. Material - Columbia tends to stick to nylon, polyester, and on occasion, a bit of suede. These materials are designed for activewear, meaning they’re usually waterproof and allow proper breathability. On top of that, they’re easy to maintain and don’t warp in the wash. Comfort - Columbia has been built around activewear, and with that, they need to remain comfortable throughout high-intensity training, so for normal day-to-day activities, they’ll remain form-fitting and comfortable through everything. Warmth - Columbia jackets basically come in two different levels of warmth. You have the puffier winter coats, and the windbreaker-style jackets. Their winter coats do a fantastic job at insulating you, but warmth isn’t the primary factor for the latter jacket style. It provides some insulation, but you’ll also want a proper layer underneath. Durability - This directly relates to how it comes out of the wash, how the elements bear on it, and general wear-and-tear resistance. This is where it’s critical to look at user reviews. Waterproofness - Most Columbia jackets come with a little bit of waterproofing, but you still have to pay attention to the IP water resistance rating (if the jacket has one). Color - Color doesn’t affect Columbia jackets all too much. Their dyes are woven into the fabrics they use aren’t very potent, and rarely fade with age (on nylon and polyester shells). Most of these jackets come in at least a dozen different colors and styles for you to choose from. Straight out of Portland, Oregon, Columbia Sportswear has been fighting the good fight for over seventy years. Their dedication can be be seen by taking a good, hard look at Gert Boyle: reigning Chairman for over forty years, more than half of Columba’s history. She’s been thirsty for business, and kept with sincere, honest, transparent apparel that follows their Transparency in Supply Chains Statement. Their history is a lot deeper than that. Gert’s parents, who founded Columbia Apparel after buying a small hat shop in Portland, were refugees from 1938 Nazi Germany. It’s been in the family since its inception, and sticks to core family values to this very day. Passionate people, proper apparel, and a desire to keep you warm, dry, and cool during your sporting activity. Q: Why Choose a Columbia Jacket? A: Columbia rests somewhere on the middle of value and quality, and as you know, there’s always a difficult balance when you don’t want to spend a large budget on few pieces of clothing. They define that very fine line. Columbia is a quintessential activewear brand that should be somewhere in your closet, whether it’s in the form of shoes, equipment, or accessories. No brand is perfect, but the ones that strive to be as close to perfect as possible, usually stand taller than the rest. Columbia offers fantastic warranties, and very attentive customer service representatives who are ready to either answer all your questions, or point you to the right directory to find numerous answers on your own. It’s a look, but it’s also something that fits into specific lifestyles. Q: Can Columbia Jackets be Washed? A: Yes, almost all Columbia jackets, unless otherwise specified, are completely able to go through the wash. It’s preferred to use a no-spire HE washing machine, but even if you have that spinning in the center, it’s not going to damage or warp the jacket. You’ll mostly need to wash your Columbia jacket after long exercise patterns, or if you use it every single day to leave the house with, and can’t remember the last time you’ve cleaned it. Where most of them come with a fleece or soft fabric liner, it will absorb sweat over time. If you’re using this as an activewear jacket, you’ll have to do this fairly often. Lastly, if you’re not keen on throwing it in the washer and drying it, you can either take it to the dry cleaner, or simple take a few wet wipes/wet paper towels to the exterior. Just be certain to check the interior for any potential odors or spills. The last thing you want is a stain that can’t be lifted. Q: Can You Put Your Jacket in the Dryer? A: Columbia jackets can go in the washer, but they the polyester shells on most of these jackets aren’t going to react well to the heat from the dryer. These are best to be line dried, or hung out to dry somewhere in your home if you don’t have access to an exterior line. That being said, it’s going to take a while for your Columbia jacket to dry. There’s usually two layers, which leaves a little bit of room in been them, and a longer drying time. The only way you can avoid this is if you dryer is HE, you put it on gentle, low-heat tumble, and you put nothing else in there. If you’re using this every day, you’ll want to clean your jacket fairly regularly, so plan out how you expect to use it, how often, and what cleaning method you’ll be using. Q: What is Columbia’s Omni-Tech? A: It’s better explained as a dual system that aims to keep you nice and warm (as your jacket should do), while also ensuring you don’t overheat. 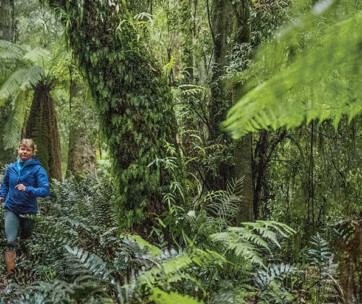 Since Columbia designs most of their gear for activewear, they’re expecting you to hike, run and climb in their jackets, so regulating body temperature is important. It also means that they’re waterproofed, tooth and nail. Just about every single spot on your Columbia jacket has waterproofing, and omni-tech is able to regulate temperature while dealing with the rainfall. 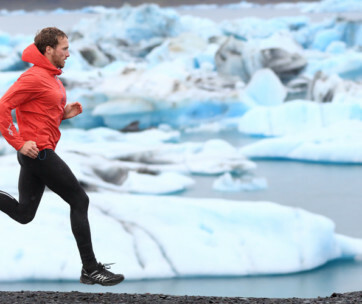 Keep in mind, you’re still going to heat up from your run (that’s just your internal body temperature), but Columbia wants to make sure you aren’t slipping your jacket on and off for the duration of your run. Keep it on, keep going, and they’ll be with you all the way to the finish line and back.